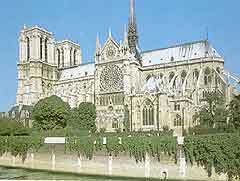 Paris attraction-guides.com - Paris, France attractions guide featuring Paris, Ile-de-France Cathedrale de Notre-Dame-de-Paris information, including location, contact details, opening hours, history and general Paris, Ile-de-France, France FR Cathedrale de Notre-Dame-de-Paris information. - Last updated 30/10/2012. The Notre Dame was founded in the 12th century, and is known as 'Our Lady of Paris' and is situated at the heart of the city on the banks of the River Seine, on the Île de la Cité area. The histories of Paris and Notre-Dame are interwoven. It was here that Crusaders prayed before going off to fight in the holy wars, and in 1804, Napoleon crowned himself emperor and then crowned Josephine as his empress. A masterpiece of Gothic architecture, the stunning Notre Dame can hold a congregation of over 6,000.